Installing fans in your Xbox 360 is a good decision to make because it protects your Xbox 360 console from overheating and causing internal damge to your system. In addition, it is an easy modification you can do. There are many different fans to buy out there however i reccommend getting a fan by XCM. XCM has fans that replace your original fan and fans that don't. Fans by XCM are also easy to install because they plug into a power port that is already in the Xbox 360 and requires no soldering. What Type Of Fan Should I Get? First I would recommend putting in the core cooler V.2 twin fans by XCM because it adds additional cooling and more fans like I said on the first page. 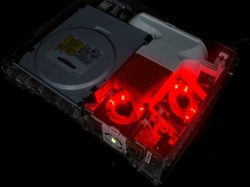 These fans come in three different colors LED colors of red, green, and blue and even makes your Xbox 360 look awesome if you have a window cut out in your case. A tutorial for cutting out a window would be under cutting out a window section on your top left hand side. Second I recommend adding the Whisper Max fan. This fan replaces the stock dual Xbox 360 stock fan in the back of the Xbox 360 console, and the newer fans can move much more CFM's (Cubic Feet per Minute) than the original stock fans and can move more air than the original fans. In addition, the Whisper Max fans are much quieter than the originals and have much better bearings. These fans are sure to keep your Xbox 360 much cooler. Is My Xbox 360 Cooler? Now your Xbox 360 should be much cooler there is no need for adding more fans at this point. This combination of fans is sure to keep your Xbox 360 cool, however you are welcome to create your own combination of fans to keep your personal Xbox 360 cool because there are also many other Xbox 360 fans that keep your console cool.